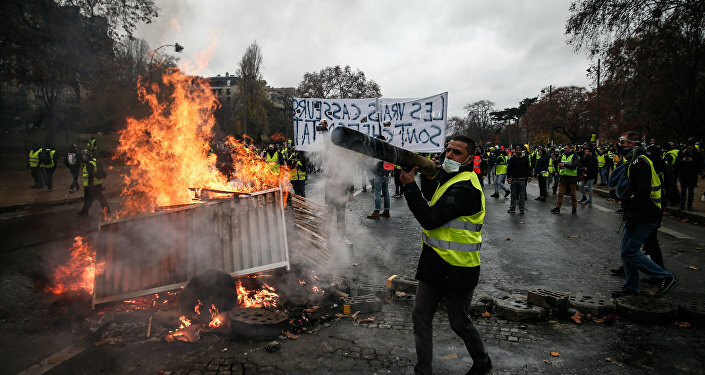 Bringing the country to almost a standstill by blocking transport links and fuel supply, the French have demonstrated “people power” and what can be achieved when we organize for our rights.Macron’s government has caved in to scrap plans for tax hikes on the transport fuel. 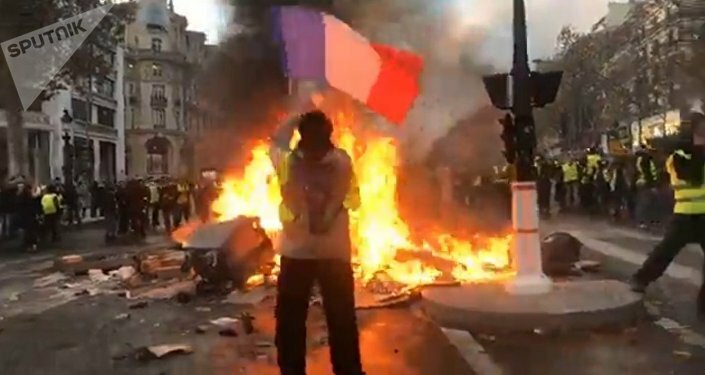 Those proposed price hikes is what triggered ordinary people’s fury, donning the now symbolic “yellow vests” that all drivers in France are obliged to carry in vehicles for safety reasons. The French public say the new taxes would hit their livelihoods. Macron claimed the new fuel levies were for raising government funds in order to pay for transition to a more ecologically sustainable society. However, ordinary citizens point out that Macron — whom they disparage as “president for the rich” — recently abolished taxes for the very wealthy. That giveaway could have been used instead by the government to fund whatever green projects it is planning. Macron’s administration is also planning major tax reductions for big business and corporations. Again, that move shows the elitist priorities of this president and his ministers. The Élysée Palace is intent on making the majority of working people pay for social changes, rather the rich class who could easily afford it. In addition, the French state spends about $50 billion a year on military. If that expenditure was, say, halved, then there would be no need for austerity and arbitrary cuts in public services and welfare. The French extravagance on military is typical of all Western states and NATO members in particular. If they slashed their militarism, then other countries like Russia and China would also be able to reduce their military budgets, which are maintained out of defensive posture owing to the aggressive stance of Western states. The French yellow vest movement appears to be at a momentous turning point. It could go either of two significant directions.Already, the Macron government has capitulated over its brazen tax burdens on ordinary citizens. There is a sense that the elitist president and his administration are teetering to stay in office. For the French people their protest movement has gone beyond fuel levies. They are questioning the entire neoliberal capitalist system, and why they have been made to endure decades of economic exploitation and oppression. 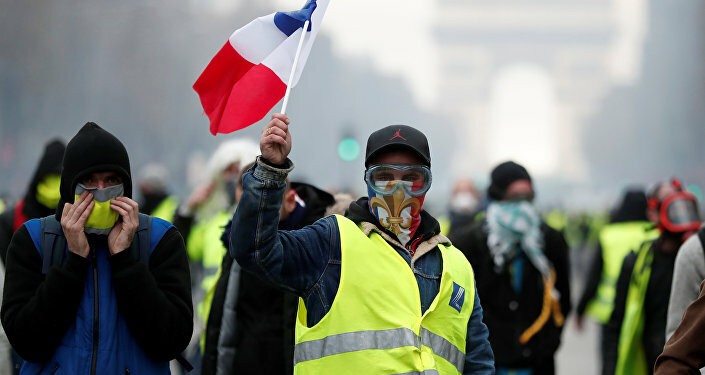 Moreover, there are signs that the yellow vest movement is inspiring the public in other European countries to likewise take to the streets and finally hold the oligarchic system to account. There are reports of similar solidarity protests taking place in neighboring Belgium. We can be sure that governments across Europe are wary of a tidal wave of people power. There is also a more ominous, sinister direction. A foretaste of that was seen last week when French riot police arrested dozens of high school students rallying against education reforms, and made them kneel on the ground, hands on head. Some of the students were forced to kneel with their faces against a wall. That scene has horrified many people in France and further afield. It bore the actions of a police-state dictatorship and the abrogation of legal rights. Some commentators even remarked that the detained students cowering in front of armed officers looked like a mock-execution scenario. 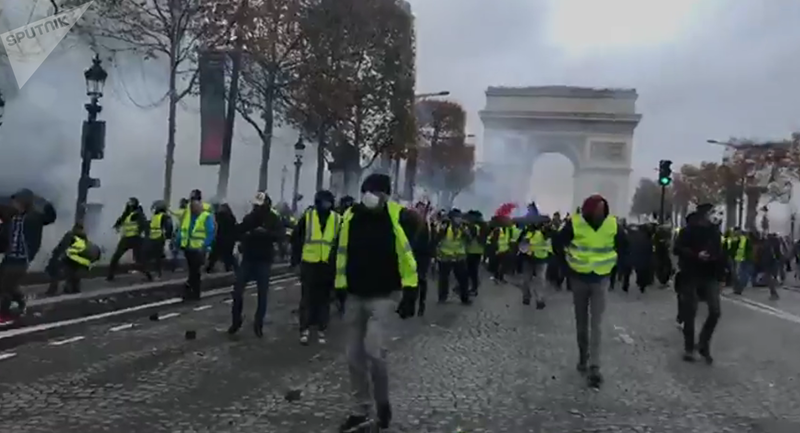 This weekend ahead of the planned protests in Paris, hundreds of people traveling to the capital to join demonstrations were arrested “preemptively” by police, and taken into custody. The French authorities claim they were preventing “trouble makers” from inciting violence. Though many other French citizens fear that what is really going on is the beginning of repressive crackdown by the state against democratic rights to free speech and public assembly. Recall too how only a few weeks ago, during World War One commemorations, President Macron sparked a hue and cry when he praised former General Philippe Pétain for his battlefield bravery. Pétain later became the leader of Vichy France which collaborated with the German Third Reich during World War Two. Ignominiously, the French state functioned as a fascist regime, rounding up tens of thousands of its citizens, and dispatching them to Nazi death camps. Arguably, capitalism is an irrational, anti-democratic system that always has a tendency towards oligarchy, militarism and fascism. When the economy is doing relatively well, then the system tolerates forms of “liberal democracy”. But when the system is running on empty, then more extreme powers are exercised to control the restless masses.Decades of economic austerity and mass impoverishment across Western states show that capitalism can no longer disguise itself as liberal democracy. The people are rightly becoming restless and angry for their human rights: to have decent jobs, salaries and public services. The rebellious French are inspiring all people to demand what is their natural rights and to overthrow the injustice of capitalism. That could go in an historic progressive direction, not just in France, but across all Western oligarchic states. There again, the powers-that-be may, out of desperation to retain their privileges and wealth, go full fascism. The liberal mask of Western democracies appears to be slipping to reveal the brute force beneath. We seem to be at a historic juncture.